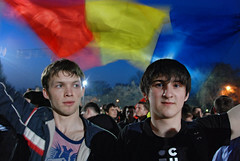 Well, it's not Twitter and Facebook but the cunning means through which over 10,000 young Moldovans managed to reach out to each other through the services. By harnessing a unique tag for their protests it was easy for the mass to get together at the same place, same time, for the same purpose. My question: how many of Britain's young people would a) know about the existence of Twitter, b) know what a tag is and c) how they could use a tag to convene a protest or campaign? It kind of puts into startk context the English Government's plans to 'teach Twitter' and the perhaps better-formed plans of the Scottish Government to include text messaging and social networks language in the fabric of language teaching and learning [pdf]. Read more on the NYTimes. Pic from Flickr's own blog post on the photos captured. For a few months I've been testing Quintura's new site search, a tag cloud search engine which you can easily add to your own blog and which searches only the content of your site. It gives some interesting search results for archive posts on this blog. Now, you can go and get it for yourself. Enjoy! On Monday, Quintura will relaunch their safe search for kids with a Christmassy feel, but edu.blogs.com readers can take a look and get your kids surfing straightaway. I really like the visual approach to searching for images, movies, tv or gaming sites, and, of course, Quintura's beautifully slick visual search makes it easy to find stuff you never knew you wanted. Last month Yakov and the Quintura team won the first place in to the Top 100 alternatives to Google, and I can see why. 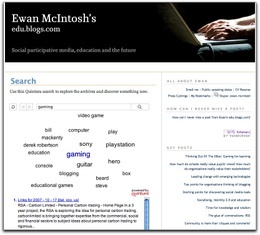 They've been working with me on some impressive personalised blog search, too, which you can try out if you want to search the anals annals of edu.blogs.com. Let me (and them) know what you think. Is it returning useful stuff, or making you discover things you didn't know you wanted to know? Swathes of England devastated by floods, 24 hour news providing unrelenting images of flooded high streets and most of us left with only the vaguest of ideas of where this is all going on. Not now. Google Maps allow any individual to plot points on a map to tell a story. 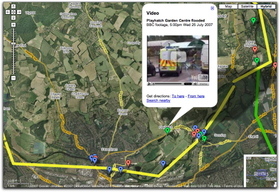 BBC Berkshire do this is tremendous style, illustrating the extent of this summer's flooding by plotting and bringing in their own TV and radio reports, user generated photographs and video, Environment Agency flood warnings and the magic of Google Maps' satellite imagery. I clicked the 'KML' button to open up Google Earth and have that same information sitting on my version of the planet. Importantly the main BBC Berkshire website gives a prominent link to their "interactive floods map", thus pushing this kind of thinking and technology further into the mainstream. Since yesterday's post there has been a lot of interest in Jen Macaulay's classroom as a place of playing and learning, comments from both teachers and those working in business and a huge number of views. The classroom has been added to the expanding Classroom Displays group on Flickr, too. I'm getting the feeling there is a genuine desire for more sharing of classroom environments through video, photo or text, a desire that's always been there for this teacher but which is now made far more possible than ever before thanks to the tools at our disposal. is there a role for students in documenting their learning space as part of their own learning log?